My mom receently reminded me about this recipe because it’s fall – apple cider season. Thank you, mom! I had forgotten about it. We had a bit of trouble finding cider that doesn’t have preservatives in it, but scored at grocery store #2, and later, at an on-farm market. The whole family (including 11-month-old P) has been eating this most days for breakfast since starting the October Unprocessed challenge. 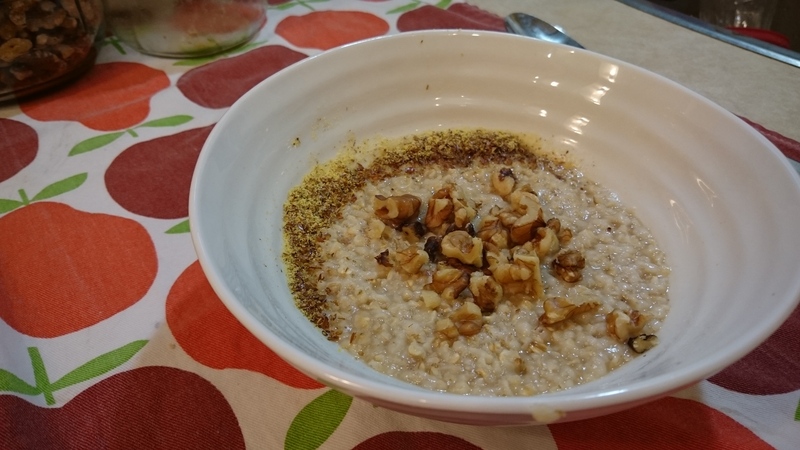 A few days I didn’t have time to make steel-cut oats and substituted the more processed, but still whole grain quick oats. If your slow cooker isn’t from the ’70s and you’re not scared to leave it on overnight, by all means, bust it out for this recipe. But keep the heat on as low as possible or you might end up with glue. 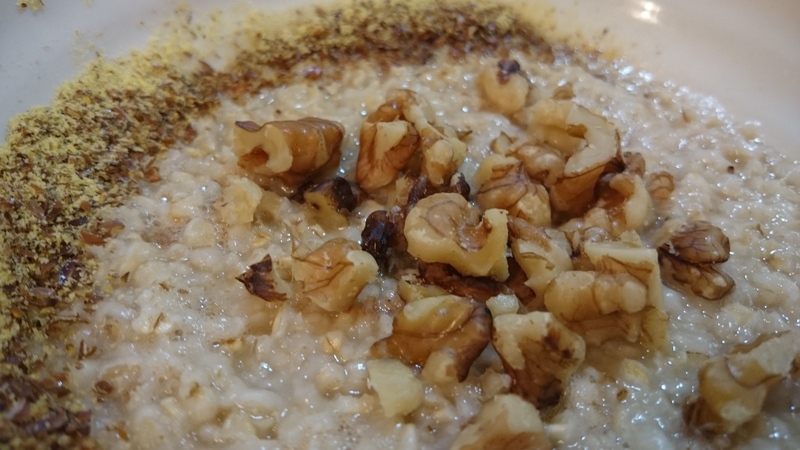 A naturally sweet oatmeal porridge recipe made on the stove. Or, try it in the slow cooker. Pour apple cider and water into a medium-sized pot and bring to a boil. Stir in the oats and reduce heat to simmer. 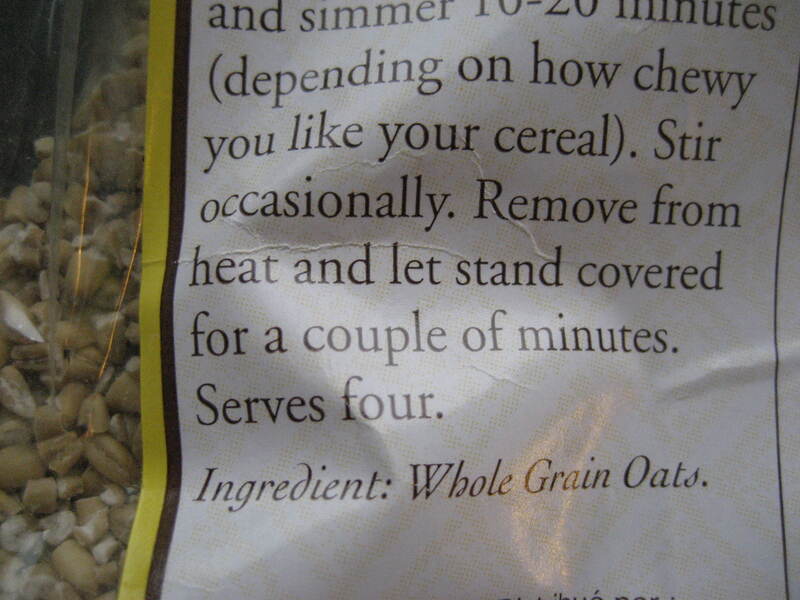 Cook 20 minutes or until most of the liquid is absorbed and the oats are desired tenderness. Serve hot, topped with milk or cream, walnuts, and/or ground flaxseed. This recipe will also work with quick oats or rolled oats. Omit water and adjust cook time according to package directions.